As healthcare systems expand their reach and acquire more hospitals, the case for the development of offsite or independent laboratories is becoming increasingly viable to institutions. For a growing system, laboratory requirements such as automated systems for throughput and efficiency simply cannot be situated in existing hospital floor plates. An offsite, centralized lab enables staffing to become more streamlined, while still allowing collaboration between pathology groups. The 24/7 freestanding lab concept provides more flexible and modern capabilities which are efficient and incorporate interactive space to better serve a health system from a central location. Rapid response labs should remain within hospitals for stat support. In recent years, Montefiore Medical Center has expanded treatment services to serve more patients in Bronx, Westchester and Mt. Vernon, New York. This has included campus acquisitions including Mt. Vernon, Wakefield, Moses, Einstein, Hutchinson, Weiler, Medical Park, Westchester Square and New Rochelle. As their patient volume has grown, so has the need for laboratory services – more than doubling in the past decade. As Montefiore’s clinical programs expand, this demand will only continue to increase. To meet this demand, Montefiore has planned a state-of-the-art laboratory - The Center of Diagnostic Medicine - in Mt. Vernon. The new 24/7 laboratory medicine building will maximize operational efficiency, allowing the laboratory team to provide test results faster and reduce the amount of blood needed from a patient to generate those results. Key drivers and considerations for designing the offsite hospital laboratory were evaluated. Insights, innovative design features and lean construction practices were incorporated to create this central facility designed to accommodate system-wide pathology services and medical residency training. The accommodation of an ever-changing industry and technology developments are essential. Will advancements work in or can they be phased into current lab spaces is the question. Any growth of a health system to service newly acquired hospitals is often predicated by efficiency and better services. The rising need to utilize existing hospital space for expansion of patient services is a huge factor in looking at offsite options for non-critical patient care rather than utilizing more space within the hospital footprint. Consolidation of services in one location provides the opportunity for expertise, collaboration and enhanced research opportunities. The chance to map new workflows and process improvements around new automated technology which usually can’t be incorporated appropriately in existing spaces/floor plates is also a motivator when considering offsite and centralized space. 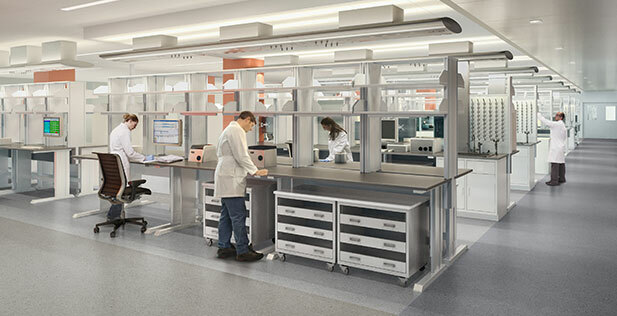 Montefiore Medical Center’s Center for Diagnostic Medicine includes a 112,000 SF warehouse retrofit including core, shell and 24/7 reference lab fitout. The design incorporates Lean principles and right-sized spaces for: medical pathology (autopsy/morgue), clinical pathology (autopsy), mass spectrometry, anatomical pathology, microbiology, electron microscopes lab, molecular infectious disease and genetics / genomics services (cytogenetics, molecular pathology). These functions are being relocated from the main Moses campus and six hospital locations. The remaining laboratory areas at the Moses Campus inpatient facility will be converted into a Rapid Response / Pathology Lab as part of 17,500 SF master plan and implementation project. This lab will support clinical pathology (automated) and anatomical pathology cases that need to be expedited. 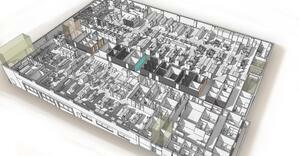 Montefiore developed an initial analysis based on existing square footage and cellular/dispersed lab functions. The team then assigned projection growth factors on system hospitals as well as projected new acquisitions. Array’s team studied the available information and projections and proceeded to program a realignment/analysis plan with open plan concepts where appropriate. Key in the planning process was Lean analysis to achieve an efficient and contemporary design. Array zoned the work spaces t o allow for future growth of the automated equipment (such as Sysmex, Roche and Kiestra). We designed the departments supporting the equipment to create an optimal flow around specialized equipment, maximizing efficiency. Infrastructure and support are centrally zoned, and all offices are clustered to maximize collaboration opportunities. By centralizing the lab functions from all locations into the offsite lab, we were able to incorporate all of the client's desired features. The planned space zoning within the offsite location made MEP considerations highly achievable, flexible and allow for future expansion. By taking lab services offsite and expanding hospital-based services at each facility, increases in patient satisfaction and market-share are expected. Being able to provide appropriately-sized departments in the newly-acquired square footage will increase functions and fulfill requests from staff for optimal work environments. For more details on this project, please download the case study by clicking the button below.